Sir Alex Ferguson and Scottish FA performance director Malky Mackay - just two of the former players, and well-kent faces, who helped Scotland's oldest football club celebrate their anniversary. But, as Queen's Park come to the end of their 150th year, they enter 2018 needing even more influential backing as they face one of the biggest challenges to their own longevity - and that of their famous home, Hampden Park. Scottish football owes its existence to that meeting at 3 Eglinton Terrace, Glasgow, on 9 July 1867, when Queen's Park's first president, Mungo Ritchie, used his casting vote to choose their current name instead of The Celts. Many tangled webs have been spun since the side nicknamed The Spiders took to the field in their first game in the city's south side, became the first team in the world to adopt the modern passing game, helped organise the world's first-ever international game and dominated the early domestic scene by winning the Scottish Cup 10 times. However, Queen's Park not only continue as the only amateur club playing in British senior football but also remain the custodians of what has been the national stadium for 115 years. Now, though, the Scottish FA's Project Bright, which is considering alternatives to extending its lease beyond 2020, casts a long shadow over the League One club's own modern but less imposing offices at neighbouring Lesser Hampden. It is the gravest threat to Queen's Park since the building of the present Hampden forced them into administration - and arguably the biggest decision facing Scottish football in the next 12 months, overshadowing the choice of national manager. The current arrangement began after the completion of the £63m South Stand, with the 20-year lease due to end after a six-month extension agreed to allow the SFA to host Euro 2020 fixtures. Queen's Park president Alan Hutchison pointed out: "Written into the original contract was an option for the SFA to continue the lease for a further 20 years with no changes to the terms and conditions. "So that is one possibility, but it is one that the SFA has indicated in informal discussions with us that they are not keen to take on." That has left Queen's Park watching anxiously from the sidelines while the governing body courts more cash-rich suitors. Rangers' Ibrox Stadium, Celtic Park and Scottish Rugby's Murrayfield are among potential alternative venues for international games and major domestic cup games. "Until they come out, presumably early this year, and tell us what is their preferred direction of travel then we have to consider all the options," Hutchison told BBC Scotland. "I don't think it would be revealing any secrets to say Hampden Park would not be a viable business without the big games, so we would have to look at a different business model. "If the SFA walk away, we would be having some interesting discussions with the government and council." Could that force them to tear up the guiding principles enshrined in their own motto: Ludere Causa Ludendi (To Play For The Sake Of Playing)? "For as long as the club can survive as amateur, it will do so," Hutchison said. Queen's Park have already overcome two of the three major challenges he cited in his website blog at the beginning of 2017. Under Project Brave, the SFA's reorganisation of youth football denied "elite status" to clubs unable to offer a 16-year-old full-time paid football, which left Hutchison fearing a demotion to "boys' club level". "But, when Malky Mackay was appointed SFA performance director in 2016, he quickly recognised there were a number of clubs, like ours, with youth development programmes well-regarded, competing at a high level but who would not meet the elite criteria," he said. "And he managed to persuade the powers that be that this performance level should be introduced and that would allow us to continue to compete at a high level." 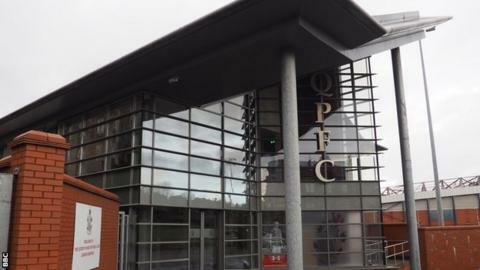 A Scottish Professional Football League review of registration processes, in light of some clubs being accused of not paying the national minimum wage, also meant that Queen's Park could no longer sign players from professional clubs under a special arrangement where they had paid "£1 in lieu of expenses". The Spiders, who annually find their best players poached by professional clubs, now have to wait for 30 days to elapse between a former professional playing his last competitive game and signing as an amateur. "I don't think it caused any problems this year," said Hutchison. "We have to attract players not by paying them wages but by showing them the facilities they will be training and playing in and by making sure they are properly looked after." That is where Hampden comes in, the prospect of playing home games at even a ghostly national stadium with a sprinkling of fans occupying its 52,000 seats being enough to persuade many a prospect or ageing pro to don the black and white hoops. Hutchison hopes the SFA will not listen too much to some of what he views as "fatuous" criticisms from Hampden's detractors when its board next meets late in January. "I accept that, if you are at the back of the east or west ends, you are quite far away from the park, absolutely, but that's the price you pay for having an oval stadium that allows you to have the Commonwealth Games there," he said. "At some point in the future, is it possible that could be rectified? I suppose it could if somebody was prepared to pay for it. "As for the issues of getting in and getting out and transport - that, to me, is laughable when you look at the number of railway stations and bus routes round about." No matter what the SFA decides, former club doctor Hutchison can still "see a bright future" for Queen's Park, who ended the calendar year having lifted themselves off the foot of Scotland's third tier. "Obviously the 150th anniversary celebrations have made us feel good about ourselves," he said. "There were so many different aspects to what we did and so many people involved, from supporters, members, youth players, participants in our community football programme, former players, all coming together in various aspects of celebration. "Yes, it was a celebration of our 150th anniversary and our history and our traditions and our role in developing the game both at home and abroad, but it also made us recognise where we are today. "We are not only competing at a high level in Scottish football League One but we are very proud of our youth development programme. "We are equally proud of our community football programme, which has developed over the years and we feel very strongly we are part of the local community as a result. "We would not want to see either of those diminished." How much Queen's Park can shine at their current level may depend on the conclusions of the SFA's Project Bright and whether the governing body agrees with the Stephen Watt poem composed for the club's anniversary - "Home Is Where The Hampden Is".